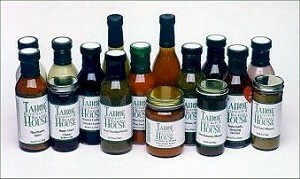 Welcome to the Tahoe House Kitchen's gourmet Online Store. My daughter, Barbara, and I are professional chefs in our bakery and gourmet store at Lake Tahoe, California. As with any two "cooks" in the kitchen, there were very few recipes that we both could agree were just right. We are always attempting to find new and interesting flavors no one else is using. This catalog presents the winners from our kitchen. The ones that didn't make it... well, we used them to keep the bears out of the dumpster. Ordering through our on-line store is no longer available. We apologize for the inconvenience. Gift cards, jams, coffee by the pound and select bottled items still available by phone order. (877) For-Tahoe.